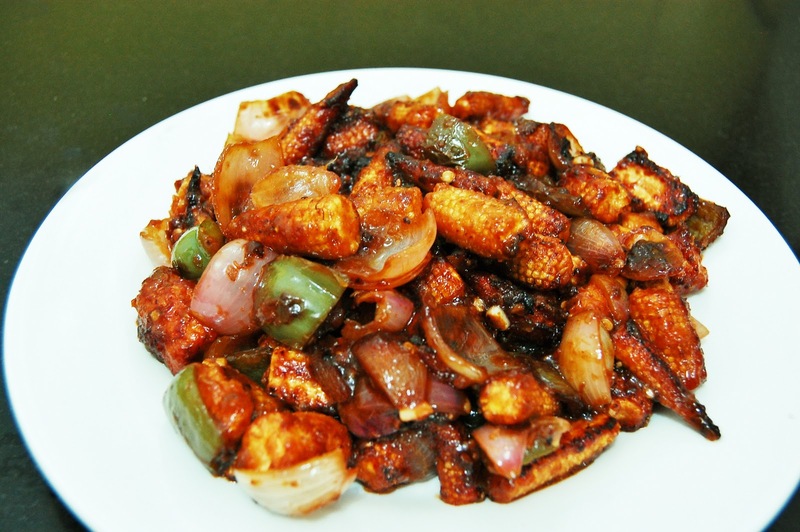 Babycorn Manchurian is a tasty dish ideal to have for a brunch or as an appetizer. Its preparation is simple and can be made in minutes. 1) Boil the babycorn for 10 minutes. Then in a bowl mix in cornflour, rice flour, ginger paste, garlic paste, salt, 1 tbs tomato sauce & babycorn. 2) Heat oil in a frying pan and fry the baby corns till crispy. Take them off the heat & keep aside. 3) Add chopped garlic into the oil. Roast them for a while and add onion & capsicum. Fry till onions turn translucent. Add green chilli paste. Saute for 1 minute. 4) Add soya sauce, 1 tbs tomato sauce, vinegar & sugar. Saute for 3 minutes. Add the babycorn & salt. Stir cook on medium heat for 5 minutes. Serve hot.